1. In a large skillet over medium heat, cook beef and onion until beef is brown. 2. Pour beef mixture into cooker and stir in tomato passata, beans, chili powder and seasoning. 3. After 20 minutes of cooking add crushed garlic and water if needed. Cook for 15 more minutes. 4. Prepare your garlic bread in the oven. 5. 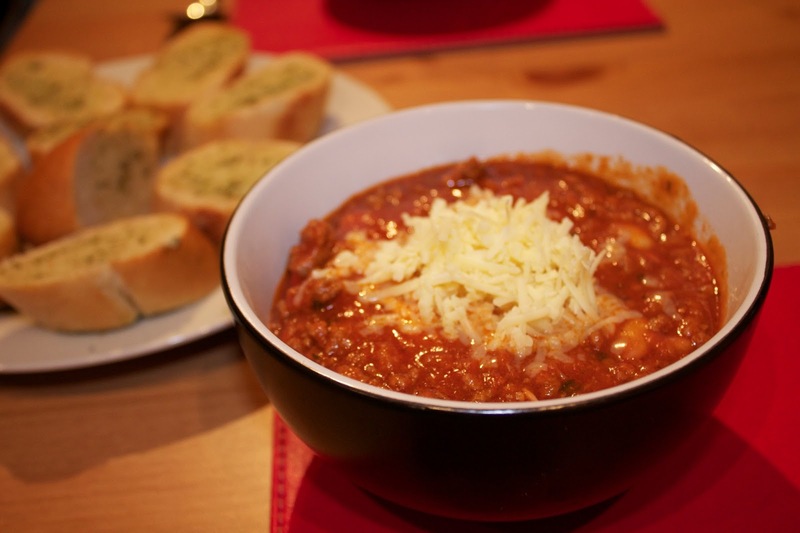 When the soup is ready, serve it in a bowl with grated cheese on the top and garlic bread on the side. This entry was posted in Beef, Recipes, Uncategorized and tagged Uncategorized by Justina. Bookmark the permalink.